Digital technology is bringing Australia’s history to people in a way that wasn’t possible a decade ago, a leading researcher on the massacres of Indigenous people has said. Prof Lyndall Ryan, of the University of Newcastle’s centre for the history of violence, said the “overwhelming” response to her team’s mapping of massacres and the project’s subsequent expansion on Guardian Australia had demonstrated the power of digitising history and taking it to a wide audience, in particular to people in regional areas. The historian leads a research team in identifying and locating hundreds of individual massacres perpetrated during the colonisation of Australia. Last week, Guardian Australia launched the Killing Times, an interactive project which, in collaboration with Ryan’s team over eight months, drew on the research, expanding and analysing it. “We both have the same aim – to generate discussion about Australia’s past, [to make] the past visible,” Ryan told a digital history seminar at Sydney’s university of technology. The Guardian’s Indigenous affairs editor, Lorena Allam, who appeared on the panel with Ryan, said the data was “solid and conservative”. The Newcastle team launched the second stage of its map in July last year, prompting hundreds of people to contact them with more information. Since the publication of the Killing Times, Guardian Australia has been contacted by more than 40 people with information that has been shared across the two teams, identifying at least 50 new potential sites. Many of those who made contact were from regional areas. “Public history has been using digital tools for many years now but I think we’re going down a different level – we’re providing new evidence of Australia’s past,” said Ryan. She hoped the public response to the project would generate more resources and an increased focus on digitising historical archives and sources. The research drew on primary sources and original accounts of massacres, including an “astonishing” amount of information from colonial news reports accessible through Trove. “The more we understand about Australia’s past, the more we’ll understand the need to digitise sources,” Ryan said. Only massacres that could be verified were mapped, and only the minimum number of fatalities estimated for each were used, a cautious approach that Ryan said “came out of the history wars”. She believed there had been “a really big shift” in the engagement of wider Australia. “People are listening now, they want to know what happened, in a way they weren’t listening, I want to say even 10 years ago. 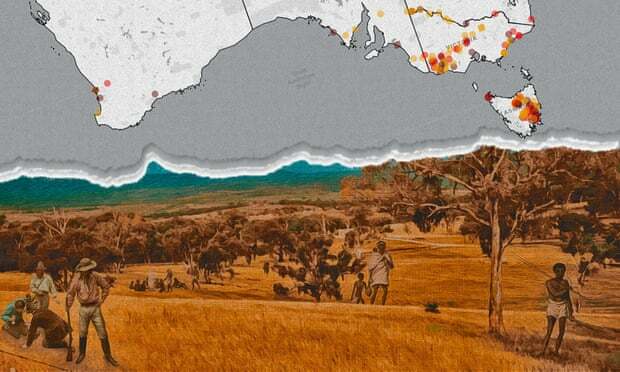 The Newcastle project ran out of funding before it could map the West Australian massacres. Guardian Australia used Ryan’s methodology to conduct research the state, finding 14 verified incidents and at least 20 more likely ones. Ryan and Allam said there was still a lot of research to be done across the country. “Where you see gaps, that’s not because nothing happened there,” Allam said.